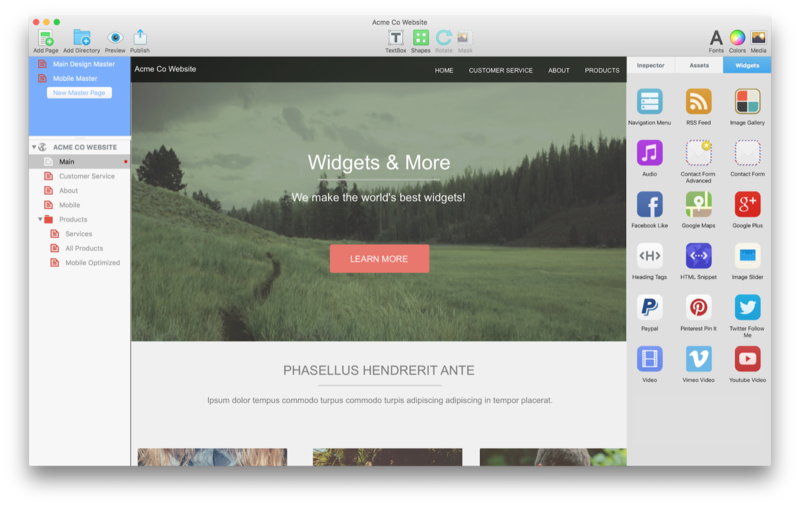 THE BEST WEBSITE BUILDER FOR NON-TECHIES! Drag It. Drop It. Publish It. Complete creative freedom! Create your website visually with absolutely no design restrictions. Place text, shapes, or images anywhere on your webpage canvas and EverWeb takes care of the rest! Absolutely no coding required. Design your website and instantly publish it to the web. Add search engine optimization (SEO) elements to your site from within EverWeb. No third-party apps necessary. Don't forget to watch our free SEO For EverWeb Video Course. Create responsive websites that work on desktop, tablet and mobile devices, all from one design. EverWeb helps you easily design your website so it works on every web browser and every device. 100+ completely free, fully customizable templates and professional designs are included with EverWeb to get you started. Choose an existing template or start designing from scratch. 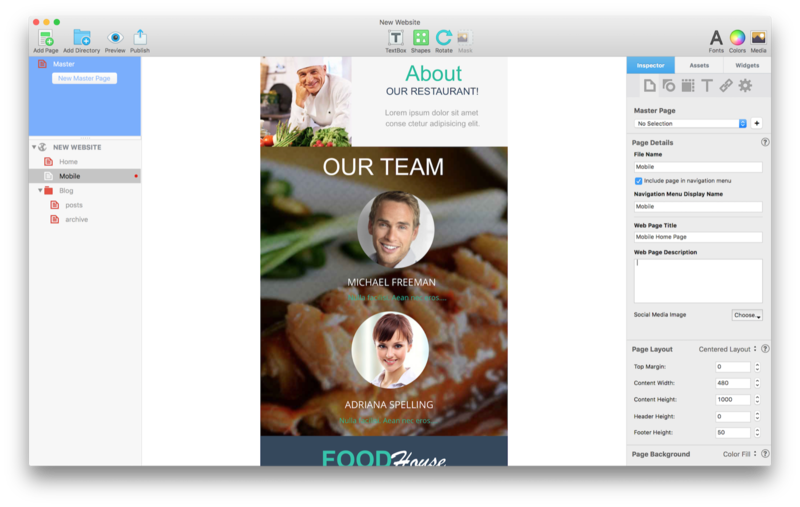 EverWeb is a drag and drop website builder, which means no code is required at all. Users of all skill levels can build beautiful websites using EverWeb. Your imagination is your limit. Automatically create dropdown navigation menus with absolutely no coding required. Over a dozen picture image frame designs helps make your important images stand out. Design your site once and automatically update all pages with your changes using Master Pages. Easily design websites using EverWeb's built in shapes including; rectangles, ovals, stars, callouts, jagged boxes and more. Easily organize all of your website's assets such as images, media and other external files so they are always readily available for you to use on your site. EverWeb includes built in support for Google Fonts. Just install the font you want to use and EverWeb makes sure it looks great for all your visitors. Get complete freedom in your design! No restrictions in how you want your website to look. 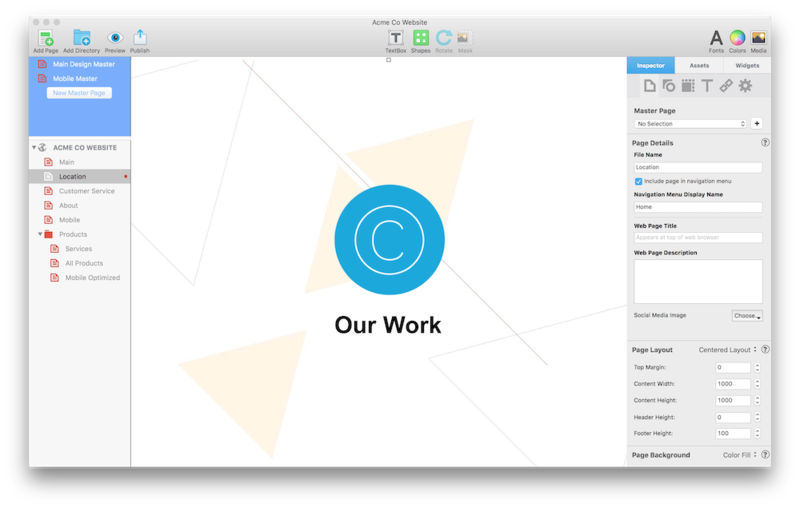 Just drag and drop any image, shape or text anywhere on your page. Easily link to other pages on your site, an external page, a PDF, downloadable file or an e-mail address. Link to specific sections on a page to offer a smooth scrolling option that looks great in single page design layouts. Add web buttons that react to user actions directly within EverWeb. Set gradients, colors or other style for an awesome user experience. Apply mouse over and hover effects to any shape, image or object to create an visual feedback for your visitors. Easily apply image and shape effects such as; transparency, shadows, reflections and more. Apply dozens of different animations to text, shapes or images to make them standout and draw attention. Create fixed objects that move while your visitors scroll your website such as a navigation bar that follows the user as they scroll. Add full width shapes and text that expands with the web browser. Objects will adapt to the width of your browser window. Add custom HTML, CSS, Javscript or anything else you may need giving you unlimited customization options. Publish your website to any server with EverWeb's one-click publishing. A complete blogging platform makes it extremely easy to start your own blog with out any technical set up. Easily offer PDF (or any type of file) to download to your visitors. Simply select your PDF file and EverWeb takes care of the rest. EverWeb gives you built in access to a searchable database of over 500,000+ royalty free stock photos. Use freely on any website at no additional cost. There's no limit to EverWeb with the powerful HTML Snippet. Add anything you need to your website with this powerful widget. Easily share your YouTube videos directly on your website. YouTube videos work for virtually all visitors and can help with your search engine rankings. 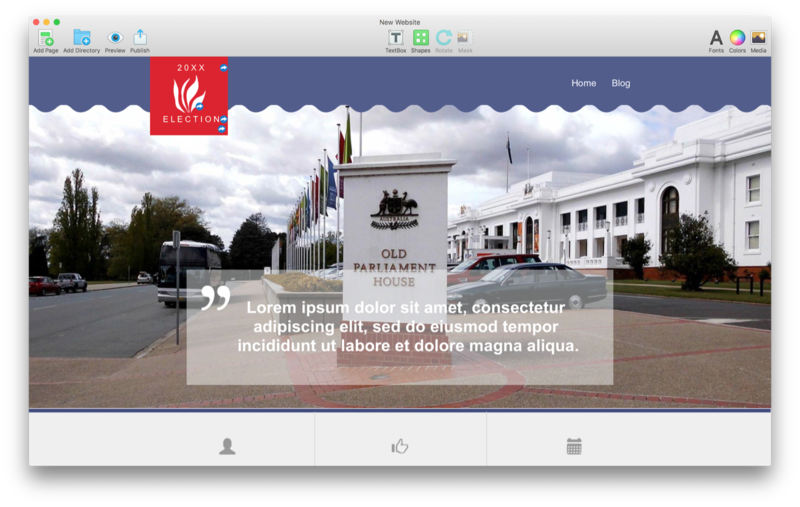 The hottest trend in website design, EverWeb lets you easily add professional image sliders that work great on Mobile devices as well! EverWeb does Audio too with the HTML5 Audio Player. Simply select an MP3 file and EverWeb will make sure your visitors can hear it when they visit your site. Easily upload your videos straight to your website with EverWeb's HTML5 Video Player. Your videos will work across all computers, devices and browsers. Increase your businesses popularity with more Likes. Add a Facebook Like button to your site without even having to leave EverWeb. Take advantage of Google+'s search benefits by allowing your visitors to give your page a plus. Get your visitors to follow you on Twitter by easily adding a Twitter Follow Me button to any page on your site. Add news feeds with EverWeb's built in RSS Feed display widget. RSS Feeds are dynamically updated automatically. Use the Navigation Menu widget to quickly add easy navigation to your website. Automatically create drop down navigation menus too! Instantly create image galleries to show off your photography, art, family or more with modern trandsitions and effects. Add advanced contact forms for your visitors to fill out and send you messages right from your website. Add as many custom fields as you need with complete customization. Allow your website visitors to easily locate your physical store by dragging and dropping a Google map on your site. Lots of third party widgets are available to add more power and modern design techniques to your website. More get released all the time! If you want to use Vimeo instead of YouTube or HTML5 Video, EverWeb provides a quick and easily widget to add Vimeo video to your website. EverWeb uses advanced, optimized HTML5 and CSS3 code to take advantage of the latest web technologies while still provided proper support for older browsers and devices. Not sure how to get your site to rank higher in search engine? Watch our free SEO For EverWeb Video Course to learn everything you need to know about getting your EverWeb site to the top of search engines. EverWeb websites are fully compatible with all web browsers and devices desktop, tablets and mobile devices. Design your site and be confident that it works no matter where your visitors are coming from. Create as many websites as you want with EverWeb. Each website has its own project file so you can focus only on the content that matters. Plus backing up and collaborating on websites is very easy!